Stuck indoors with restless little folk? 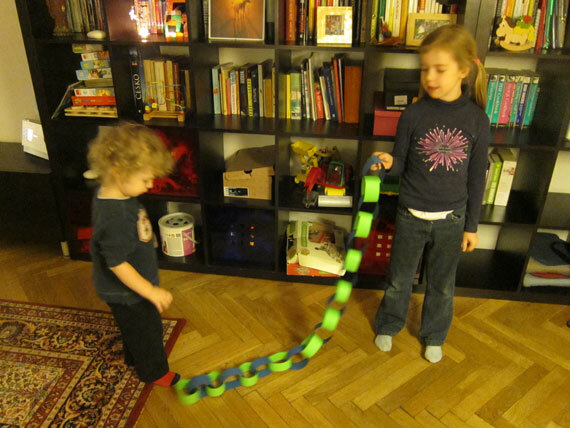 Cold weather, short days and lots of flu means that we are all spending a lot of time indoors these days. 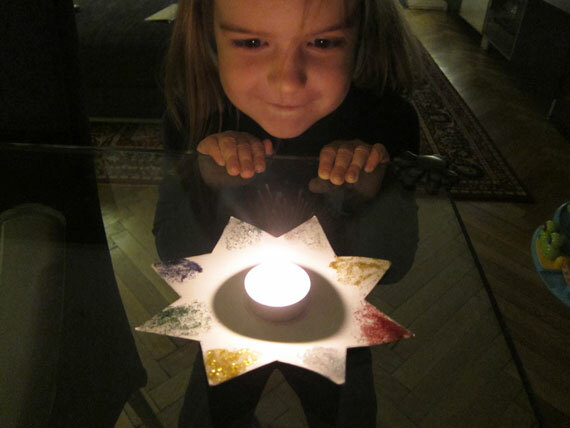 Make the most of this quiet time of year, illuminate your indoor space with lots of candles (carefully placed) and get your kids creative by trying out some of the following ideas. Very easy to do, just cut out card in the shape of a star, use glitter pens or glitter glue to bring sparkle to your holder, glue tealight candle to the middle of the star. Voila! These sweet angels are made out of paper plates, tinsel, cotton wool and some glitter glue and pencils for decoration. Kids can really personalise their angels with colouring, stickers, coloured paper - only limited by their imagination and available materials. Find the paper plate pattern here. Shape green modeling clay into a cone. shape some yellow clay into a star. stick coloured beads all over. To decorate the lid, trace the lid on some nice paper, cut it out and glue it on the top. cut some nice ribbon and stick it around the rim. Create a brown base out of clay and stick it (no glue needed) to the inside of the lid and then stick the tree to it. 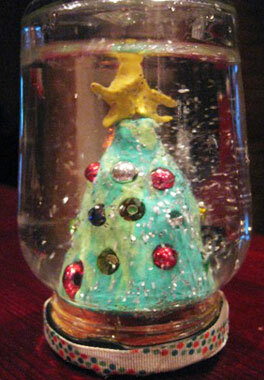 Fill your jar with water as much as you need and add about a teaspoon of sparkles. Apply some super glue to the inside rim of the lid and screw it on. Shake and enjoy! 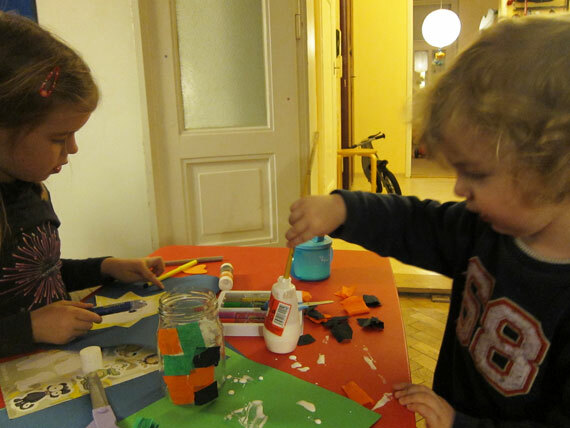 Make use of your child’s desire to paint. Set up an easel or place paper on the floor (with an old sheet underneath) and provide the paper, sponges and/or brushes - voila! We always hold onto the packing paper from Ikea - it’s cut into an ideal size and is thick enough to absorb large blobs of paint. We buy acrylic paint in bulk from art supply stores - it’s cheaper, looks great, but you have to be super careful with your kids clothes. Paper egg cartons are great for pouring the coloured paints in. Very easy and fun to make, source as much coloured paper that you can get your hands on. We had a pack of 120gsm paper with about 6 colours in it from Tesco but we only have blue and green left, thus our chain is not as colourful as it could have been. Simply cut strips as long as you can, glue one loop and then interlink each loop before glueing. Wash out a glass jar then all you need is tissue paper ripped up into small pieces - glue the pieces to the outside of the jar and leave to dry. Once dry (and dark outside) place a lit tea light candle inside and enjoy the gorgeous light. 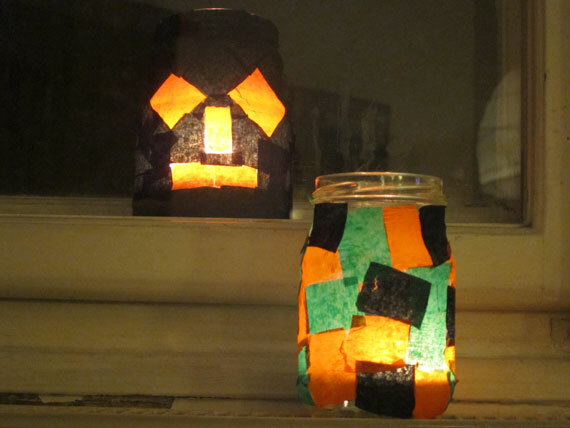 Here is our Christmas and Halloween lamps together - it’s like bringing a gorgeous stained glass window into the home. I loved making these as a child and the smell from the oranges and cloves is very evocative of Christmases past. This is a very easy and enjoyable craft for all ages, even the youngest kids can get involved by puncturing the orange with a pencil and then placing the cloves into the holes. Coloured ribbon is then tied around the orange and attached to the tree - alternatively you can place them on the Christmas table. Cloves (hřebíček) are found in all small stores amongst the packaged herbs. Of course there are many pieces from nature that can be gathered outdoors or purchased at the flower stores - pine branches and wreaths, pine cones, ribbons and candles. The examples above are just a few ideas using materials that you may have hanging around the home without a necessary trip to the shops.